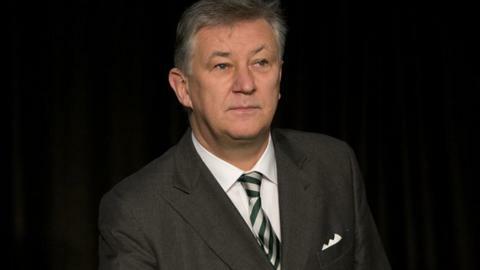 Rangers say they will complain to Scottish football's governing bodies over a comment about their club from Celtic chief executive Peter Lawwell. It follows a question asked by a Celtic shareholder at the Scottish champions' annual meeting. He was asked why some in the media refer to Rangers as a club in existence since 1872 despite their insolvency event last year. "Rory Bremner can pretend to be Tony Blair," Lawwell said in reply. Of his reference to the impressionist's take on the former Prime Minister, Celtic chief executive added later: "I was putting a bit of humour into that. Nothing more than that." Rangers, now playing in League One, followed the remarks at the AGM with a statement on their club website. "The club are disappointed with the comments attributed to Celtic chief executive Peter Lawwell earlier today," they said. "Rangers Football Club, now in its 141st year, has a proud history which has been recognised by the football authorities and was noted in a recent SPL commission determination. "The club will now take this matter up with the relevant football authorities."